Please join us for a very special Evening with Avery celebrating our recent acquisition of Karl Friedrich Schinkel’s Werke der höheren Baukunst. The evening’s program is co-sponsored by Avery Friends and Columbia’s Department of Art History & Archaeology, Collins-Kaufmann Forum. 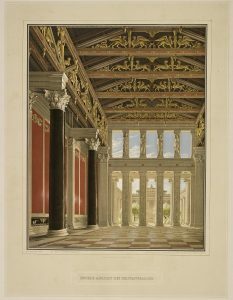 Image Credit: Karl Friedrich Schinkel, Interior view of reception hall in the royal palace on the Acropolis, Werke der höheren Baukunst (Potsdam: Verlag von Ferdinand Riegel, 1840-1848). This entry was posted in Avery Classics Collection and tagged Avery Events, Columbia Art History on November 16, 2018 by Carole Ann.